Elongated diamond frosted flowers present a scalloped floral frame on these antique style earrings. A string of abstract flowers set with fine faceted diamonds sways in the center of these elegantly engraved earrings. 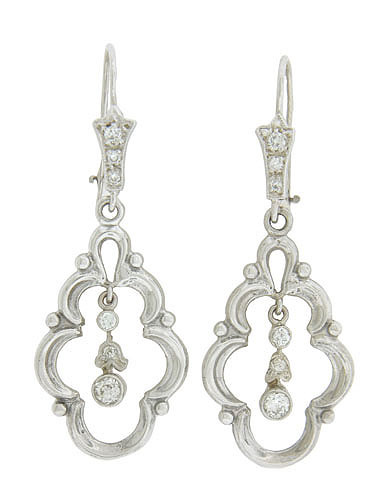 The antique style earrings are fashioned of 14K white gold and finished with wire backs. The earrings are set with approximately .40 carat total weight of round cut diamonds and measure 1 1/2" in length, 5/8" wide.